It’s happened. There’s a problem with your sewer line and it needs to be replaced! As your assessing the situation it starts to sink in, the sewer line runs under your garage, your beloved garden, your brand new patio, or your favorite shade tree! If you are thinking to yourself “this is a total nightmare”…Give us a call, we can help! Pipe bursting is a form of trenchless pipe/utility replacement. With pipe bursting The Pipeshark is able to replace sewer lines, water main line, storm sewer drains and gas lines with only two points of access. Which means there will be two smaller areas of excavation at your home; one at the beginning referred to as the “entry pit”, and one at the end referred to as the “receiving pit”. While there are many types of new material options when replacing a utility line (HDPE, PVC, Cast Iron, Ductile Iron, FRPM, and even Terra Cotta), The Pipeshark will typically use HDPE as their material of choice. HDPE is a high-density polyethylene pipe that offers many advantages. HDPE is durable and slightly flexible which allows The Pipeshark to negotiate directional changes below grade without the need to dig extra holes. Also, this pipe is “welded” together above grade and pulled into place as a single pipe, eliminating joints that allow for tree root intrusion and dislocated piping in the future! 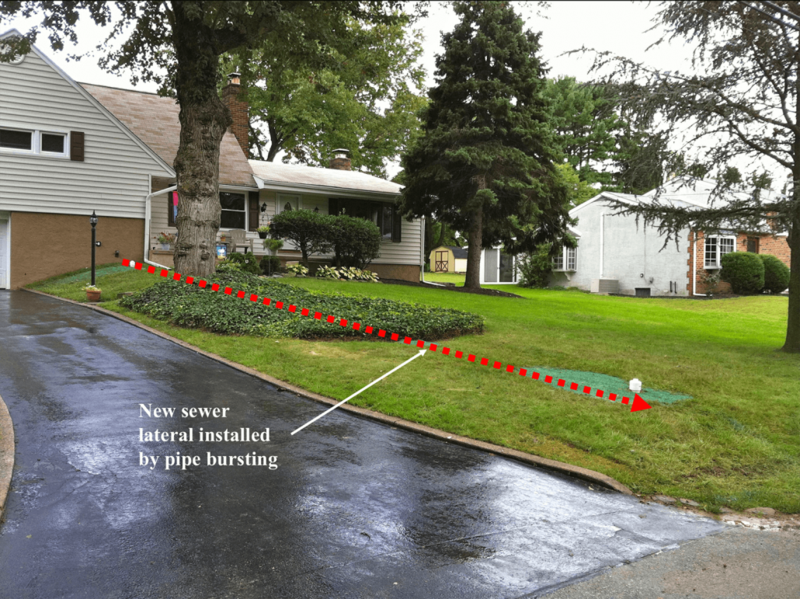 Pipe bursting is a preferred method of utility line replacement whether it’s a small diameter sewer lateral for one of our Pennsylvania residential customers who would like to save their landscaping or a larger diameter sewer main for a municipality that needs to replace a pipe under a busy road. There is no project too big or too small for The Pipeshark! If you’d like to know more give us call and let one of our Trenchless plumbing repair professionals help solve your underground utility predicament! Our Pipeshark team is extremely experienced with pipe bursting and offers this service for maintenance, pre-purchase information, and troubled pipeline diagnosis in houses, condos, and apartment complexes across Pennsylvania.